Are we on the brink of a robotics revolution? That’s what numerous media outlets asked last December when Google acquired eight robotics companies that specialize in such innovations as manipulation, vision, and humanoid robots. Among those acquisitions was MIT spinout Meka Robotics, co-founded by Aaron Edsinger SM ’01, PhD ’07 and Jeff Weber, a former research engineer in the Computer Science and Artificial Intelligence Lab. Founded in 2006, Meka was an early creator of “compliant” humanoid robots that now work safely alongside humans in everyday environments — including factories and cramped research labs. Based on the co-founders’ work at MIT, Meka’s sleek robotics hardware included adult-size arms and hands, as well as heads, torsos, and full-body systems with advanced control innovations, such as spring-based Series Elastic Actuators (SEAs) that provide torque control and measurements at each joint. All of Meka’s robots run off Meka M3 and Robot Operating System software, which allow for real-time communication. Perhaps the company is most notable for its M1 Mobile Manipulator, a $340,000 robotic humanoid that combines all of Meka’s hardware. Designed to lift and carry objects, the M1’s arms move smoothly and are equipped with strong grippers and with SEAs that allow the arms to slow down upon human touch. A customizable pan-tilt head comes with a Kinect 3-D camera, along with other digital cameras, for sensing objects. Its base is an omnidirectional platform with a mechanical lift that allows the torso to move vertically. Dozens of researchers today use Meka’s robotic hardware and software in labs around the world for advanced robotics research. “These are hardware platforms for research labs to develop algorithms for mobile manipulation, social robotics, and human-robot interaction,” says Edsinger, who was Meka’s chief executive officer. Google’s other recent acquisitions have included MIT spinout Boston Dynamics, a military robot maker, and Redwood Robotics, a joint venture between Meka and the robotics firms Willow Garage and SRI International. Co-founded by Edsinger, Redwood Robotics focused specifically on refining Meka’s robot arms. But it has greater aims of bringing manufacturing back stateside. “Designing arms is part of the story, but the bigger product solution is to fulfill that vision,” says Edsinger, now a robotics director at Google. While the technology behind Meka’s robots was novel in the mid-2000s, what continued to set the company apart in a burgeoning robotics landscape “was designing robots on human scale that had a focus on aesthetic packaging,” Edsinger says. This is perhaps best showcased in Meka’s S2 Humanoid Heads, designed with expressive eyes and emotive ears. 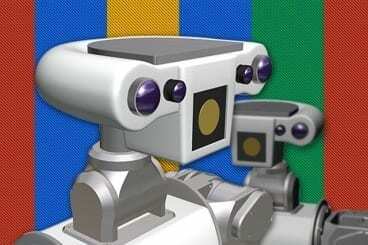 These were used to build “sociable” robots in collaboration with researchers across the nation. Simon, a robot co-developed by Meka and researchers at the Georgia Institute of Technology, includes a Meka humanoid head with 13 degrees of freedom (DOF), including independently moving eyes and eyelids, movable ears, and a five-DOF neck — which replicates a human’s range of motion. It also conveys nonverbal cues through lifelike head motions, eye contact, and blinking. Similar in specs is the “doe-eyed,” red-haired Dreamer, a head incorporated onto a robot co-developed by Meka and the University of Texas at Austin’s Human Centered Robotics group — which also uses Meka’s SEA-based compliant arms. Like Simon, it had seven DOF, with ears that curl and bend to display various emotions, such as confusion and understanding. Its eyes are equipped with cameras that track movements, and the head moves in whatever direction the eyes do. The aim of aesthetic designs for M1, Simon, Dreamer, and all the other Meka bots, Edsinger explains, is to help make people feel “affinity and trust” toward robots. But it’s also inspired from the co-founders’ time as artists. For five years before coming to MIT, Edsinger (who holds a bachelor’s degree in computer science from Stanford University) and Weber (a trained industrial designer) were visual artists in San Francisco, building anthropomorphic robotic sculptures for participation in theatrical performances. In MIT’s Human Robotics Group, then led by professor and entrepreneur Rodney Brooks (of iRobot and Rethink Robotics fame), the co-founders built the Domo robot — which had 29 active DOF, sensors, SEA-integrated arms, four digital cameras, and other innovations that allowed it to work safely alongside humans. After graduating, and while serving as a postdoc in Brooks’ lab, Edsinger had an unshakable urge to launch a robotics company, “where I could get out in the world and have an impact,” he says. Without a proper business plan, Edsinger and Weber relocated to San Francisco, carrying what they learned building Domo to found Meka. A few quick sales and contracts from researchers helped the company churn out its first commercial robotic arm in about nine months. From there, Meka sold parts: an arm here, a hand there, a head, a torso, a base. Eventually, Meka started working with the Defense Advanced Research Projects Agency, building underwater humanoid robots, exoskeletons, and prosthetics, among other things.